How to spend the least to get the best. As we said in the first part of this series, if you buy a factory turbo car, you're way out in front with the dollars that you then don't need to spend to improve performance. Most turbo car manufacturers shell out development money on brakes, suspension, engine management, engine internals and the fuel system - so it's stuff that has already been upgraded for you. Typically, power improvements of about 30 per cent can be made in factory turbo cars for very little cost. Underbonnet temps in a turbo car are often very high, meaning that it's easy to breathe in hot air. In a turbo car you're often knocking (pun intended!) on the door of detonation. Keeping intake air temps down as low as possible help to prevent this occurring. A turbo car also needs to have effective air filtration if small rocks aren't to destroy the turbo compressor. People who have fitted cone filters and/or have high-speed low-mounted intake air pick-ups often have holes in the filters that they're not aware of - so be careful in this regard. Boost pressure either side of the intercooler (if an intercooler is fitted - otherwise, just boost pressure alone). The intake air temp can be measured with a cheap LCD digital thermometer of the sort available from discount stores. When you buy one, make sure that it updates every second (not every 5 seconds) and that the temperature range goes up to 70 degrees C. (You might have to look at a few before you find one that meets these criteria.) Place the probe securely in the intake system close to the head (eg in the plenum chamber) and put the digital readout on the dash. Then watch the temperature of the intake air in a range of driving situations - on no account just fit it for a quick high-boost blast around the block. 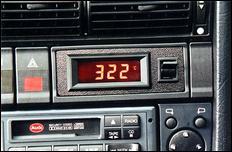 If you want a more sophisticated, permanent intake air temp display, we've covered how to build a very good one, with the series starting at "TempScreen: Part 1 - Installing the Intake Air Temp Probe". Boost pressure can be measured with any pressure gauge that reads up to the maximum boost you're likely to use - you don't need to buy an expensive purpose-made boost gauge. 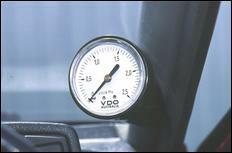 In normal upgrades, a gauge that reads to 1 Bar/14.5 psi is sufficient. 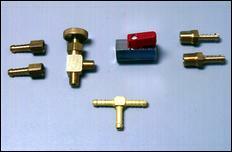 Such gauges can be purchased for about $20 from used machinery warehouses. Note that if the gauge flickers a lot, it can be damped by installing a pressure damper as found on the vacuum/boost lines of many small Japanese engines (eg Daihatsu 3-cylinder engines). In turbo cars without intercoolers, reading the intake air temp probe display will very likely show you that the highest temps occur when you've been on boost for a few seconds. In this type of car it's not unusual to see temps that go straight off the 70-degree scale... ouch! In this case, you need to make preparations to buy an intercooler before you do anything else to the car. We cover how to select an intercooler in a few moments. Highest intake air temps occur in traffic when idling on a hot day. On-boost temps are generally quite low unless you are absolutely fanging for a relatively extended period eg up a long hill on max boost. If intake air temps are high only when idling in traffic, fitting a larger intercooler won't help - instead consider making and installing intake manifold insulators of the type discussed in our article at "Cool Stuff - Manifold Insulators". If the on-boost fanging temps are reasonable (eg up to 15 degrees C above ambient) then a waterspray onto the intercooler will improve things - a water spray is a lot cheaper and easier to fit than a new intercooler. If the on-boost temps skyrocket (eg 40-50 degrees C above ambient) you should replace the intercooler. As we have outlined elsewhere in AutoSpeed, dyno testing of intercoolers almost always gives unrealistically high intake air temps because engine loads, and air movement through the core, are both not representative of what actually occurs on the road. This means that when you upgrade the power of a turbo road car, intercooler replacement is not always necessary. Note that just a visual inspection won't give you enough info to make a good decision. On intercooled cars, measuring the peak boost pressures either side of the intercooler will show you how restrictive the 'cooler is to airflow. If the pressure drop gets above about 2 psi at peak boost, the intercooler is posing an overly large restriction. This will delay throttle response and the speed with which the turbo comes on boost, in addition to giving you less power than you would otherwise have. 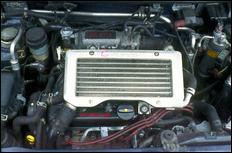 In a budget application there is no way that you should have to buy a brand new intercooler. Instead, Japanese import cores from powerful cars - eg the Skyline GT-R, Evo Lancers, Pulsar GTiR, Series 4 RX7 and so on - can be used. These cores can be picked up very cheaply. If something even larger is needed, look at modifying a discarded truck intercooler. 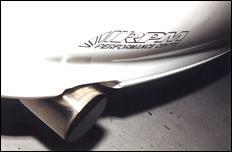 If you want it to look good, paint can be easily stripped from alloy intercoolers giving an 'as-new' appearance - see "Dip and Strip". With these sorts of intercoolers available so cheaply, plumbing the intercooler into place can end up costing more than the intercooler itself. There are a couple of ways around this. If you have a good look at the plumbing required and then make list of how many bends (and the angle of those bends) that you think you'll need, you can visit a local exhaust shop and buy the bits and pieces of pre-bent and straight pipe. Using just a hacksaw and a file, you then make the plumbing, sticking it together with electrical tape. When all of the pipework is right, take the car to the exhaust shop and have them do the welding. Make sure that you do have the car there, though, otherwise it's easy to have the plumbing turn out slightly wrong. Taking this approach - where you do all of the fiddly filing and shaping - can cut the costs down by 50 per cent. Another approach is to use large diameter (eg 2-inch) pre-formed copper pipe bends. These are sleeved so that they fit together, giving very strong joins after they have been either soft soldered (strong), brazed (very strong) or silver soldered (extremely strong). The copper tube is easy to 'work' (file and cut), too. Don't forget to use flexible hose at both the intercooler and turbo/throttle body ends. A budget approach is to visit a truck wrecker and scrounge some large diameter truck radiator hoses from which to make these flexible sections. You can find a lot more on intercoolers - including coverage of water/air intercoolers not mentioned in this article - at "The Complete Guide to Intercooling - Part 1" and "The Complete Guide to Intercooling - Part 2". AutoSpeed has already covered in some detail two DIY boost controllers. Despite the adulation accorded to expensive electronic controllers, from a value for money perspective, we've never seen any approach that comes remotely near to matching our two boost controllers. It is important when considering the merits and otherwise of boost controllers to realise that "a bleed" is not the only approach that can be taken to pneumatic boost systems. Better pneumatic controllers allow in-cabin boost adjustment, prevent wastegate creep, and allow adjustable over-boost. They can also be integrated with the electronic boost control factory-fitted to most recent turbo cars. The two boost controls can be found at: "Project EXA - Part 3 - DIY Boost Control" which is suitable for cars that don't have factory electronic control, and "Brilliant Boost " which can be used both in cars with electronic boost control and also in cars without it. Both controls cost less than $75 - and as low as $25, depending on how you set them up. 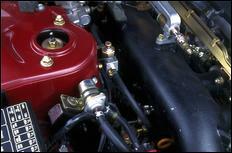 Lifting the boost pressure can be done with ease by either control. The limit to the boost that you can run will be dependent on the onset of detonation, or of the leaning-out of the air/fuel ratio. You will need to ascertain through testing the maximum boost level that can be comfortably used - at a pinch you can use the AutoSpeed LED Mixture Meter (it will detect catastrophic lean-out) but using a dyno and full gas analysis is best. Keeping the boost as low as possible (while gaining good power through exhaust, intake, intercooler and boost controller mods) is best. There's no prize in running higher boost than another guy - it doesn't mean that you'll have more power. 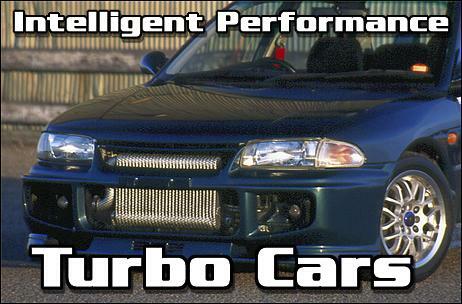 You want improved turbo car performance at a low cost? Fit a free-flowing intake duct to the airbox. Fit a large, free-flowing exhaust off the turbo. Measure boost and intake air temps. Depending on the above measurements, either: install an intercooler, fit a water spray to the intercooler, or replace the intercooler with a larger one. Fit an AutoSpeed boost control. Use a dyno and gas analysis to set the max safe boost figure.